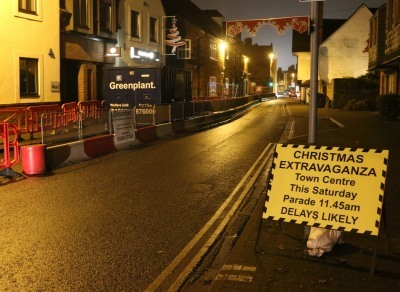 The Christmas Extravaganza road signs are there for the parade at 11:45am on Saturday, 29th November 2014. Once the parade is over there will be entertainment in the Market Place and Bath Street, and traffic can flow normally. 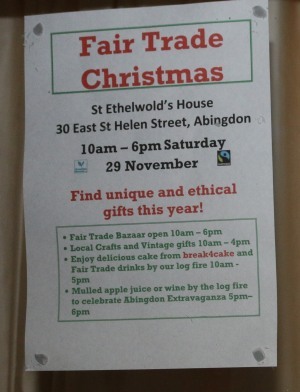 Entertainment will include a mix of Bands, Choirs, Dancers, Street Entertainers, and Punch and Judy. The Christmas lights will be switched on at 5:30pm followed by Fireworks. 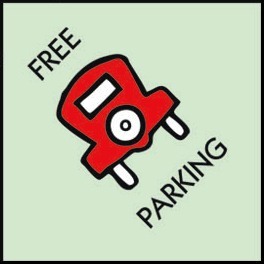 To coincide with the Abingdon Christmas Extravaganza Day there will be free parking all day in all Abingdon’s car parks. Off topic a bit, but as you can see the “comfort unit” I.e. the “tea wagon”. In the photo. Is it too much to ask if they are actually getting round to fixing the sinking culvert or something else? after I cant remember how long. I’m looking forward to the Extravaganza, I really do.